There’s a reptile in flight …. I think I was a reptile in a past-life. Usually in a constant state of seeking to nudge up the house thermostat in a bid for a warmer temperature and a place to defrost my hands and feet, I can normally be found nestled under several layers of clothing, with thermal socks and gloves that only a heat-seeking missile would be attracted to. Ironic then, that I find myself living in a Winter City where temperatures are sub-zero for at least 3 to 4 months of the year. There’s only two ways to go in such a climate – either embrace the frozen north, or hibernate; only to reappear when the snow has subsided and we start to climb into the positive temperature range around April/May time. You may be reading this assuming I’m the latter ….. but no. 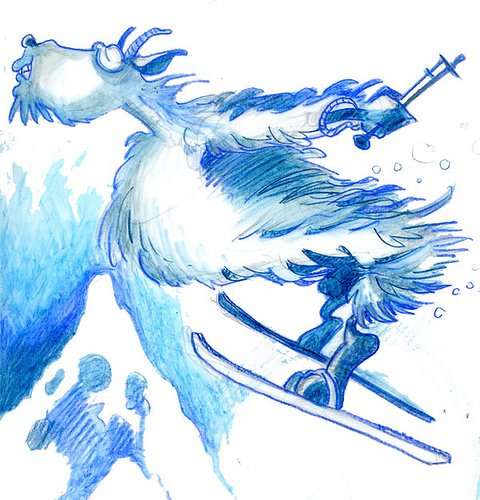 Despite my cold-blooded tendencies, I do enjoy the winter activities and especially, a spot of skiing – either downhill or cross-country. Both are readily available in Edmonton, and working in my favour for the cross-country is the fact that Alberta is a prairie-state and literally, as flat as a pancake. It certainly makes for a less arduous (and by definition, much more fun) way to experience the sport with the avoidance of any hills or steep terrain which would have me hyperventilating with effort and collapsing with sheer exhaustion. But I do miss my mountain fix. It’s one of the scenic aspects I miss most about living in the UK. That said, Jasper, and the Canadian Rockies are a mere 3.5 hrs drive to the West and are mountainously majestic on a monumental scale. 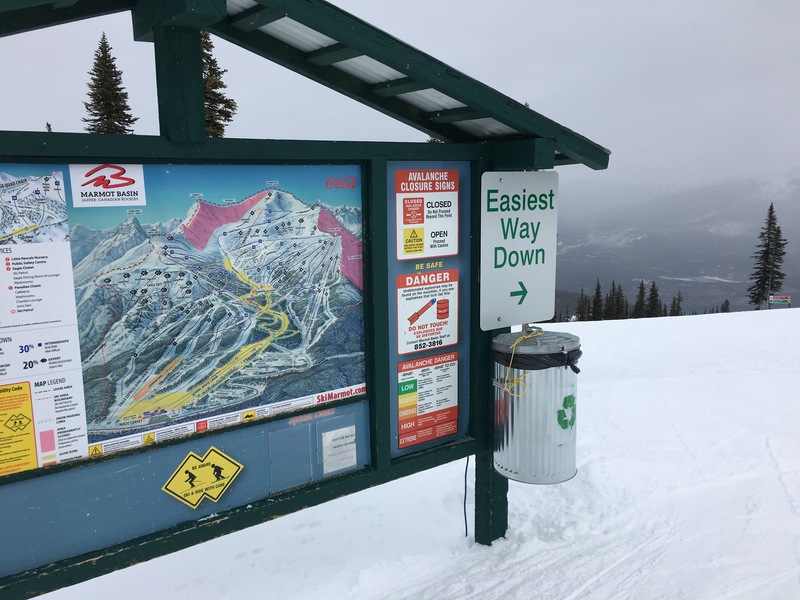 We’re lucky that we can take a quick trip there for a weekend, get my mountain fix, and attempt the downhill skiing of the Marmot Basin. 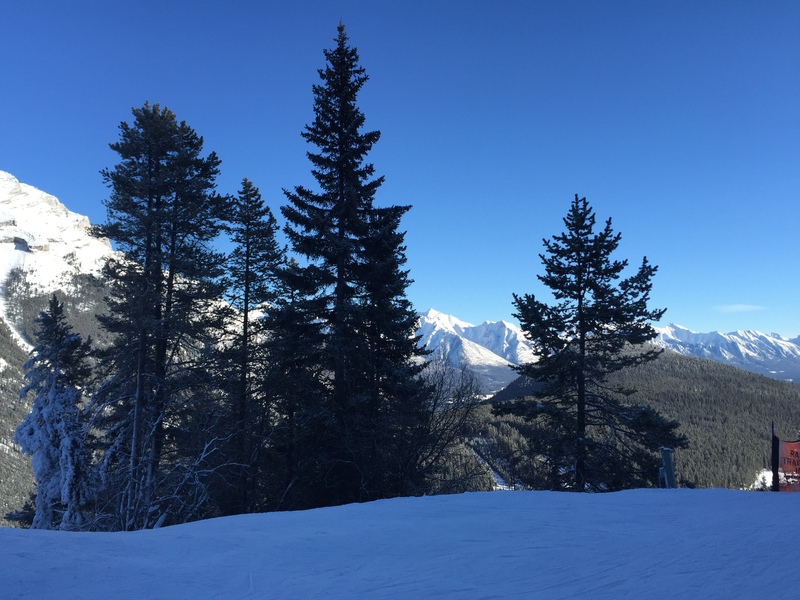 With 86 runs, the longest high speed quad-chair in the Canadian Rockies, and views to die for, it’s a spectacular place to ski. And this past weekend, we did just that. All the family have their own equipment, and during the past two Winters we’ve lived in Canada, everyone has gradually picked up the skills and technique to get them from the top of a slope, down to the bottom – hopefully, without any mishaps en route. Even my youngest kid who is now 7, will happily throw herself down the more gradual terrains – which means the whole family can ski together. My middle kid is the risk-taker, and will seek out every treacherous route in a bid to experience moments of sheer terror with shrieks of hysteria. Living on the edge is definitely one of her life philosophies …. Do you know what the collective noun for geese is? I always thought it was a ‘gaggle’, but listening to Canadian radio earlier this week I find out that there are several different collective terms for geese – all dependent on what the geese are doing at the time. For example, if geese are on the ground, then quite rightly, they’re often described as a ‘gaggle’, ‘herd’ or ‘flock’. But if they’re in flight, then it’s either a ‘wedge’ or ‘skein’. I never knew that till this week. It got me wondering how geese have managed to get to the high echelons of having so many descriptive terms? I did an internet search to see how many collective terms are used to describe the joys of having kids – and found a complete dearth. There’s many terms I’d use to describe my 3 kids – many of which wouldn’t always be complimentary ….. Anyhow. This all came about as Canada Geese are arriving back in Edmonton (maybe it was a slow news day as it was the key topic of conversation on the radio) with ‘wedges’ being spotted in full formation flying in from goodness knows where. 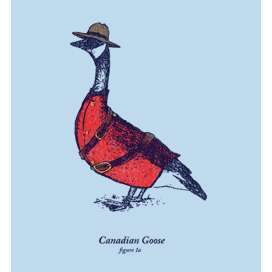 Comes to something when even the Canadian Geese migrate away from here over the winter …. maybe there’s a message in there somewhere? Being upbeat, it’s obviously a sign that the worst of the weather is over and a lot of our snow is finally melting away after months of being surrounded in a blanket of ‘whiteness’. I love the snow and have really enjoyed getting active with the skiing this season, but it’s hard to describe the feeling of finally seeing grass in your front and back lawn slowly re-appearing. Optimism, I think. That said, most of the lakes are still completely frozen so we’ve a little while to go as yet. I’ll have to temper my excitement. And it’s March already …..
Not surprisingly, the grass isn’t looking that great. Mind you, if I’d been covered with over a foot of snow for the best part of 4 months, I’d be looking rather worse for wear too. 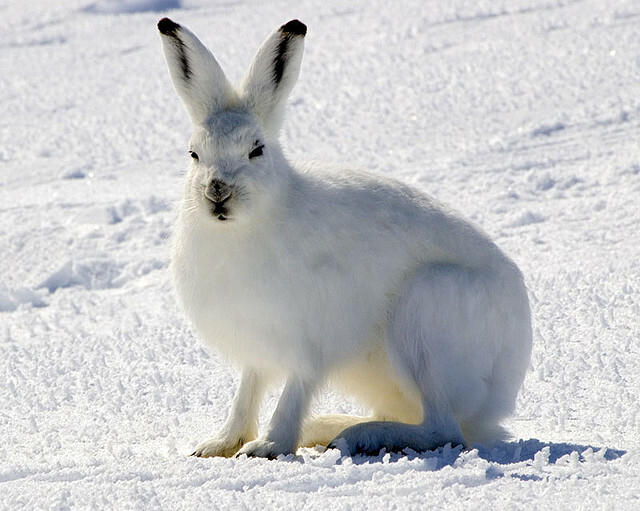 Even the Arctic Hare that visits our back garden and ‘stops over’ occasionally under the decking, is rather at a loss. His fur is still pure white so he’s standing out like a belisha beacon until his coat changes to the summer brown colour. 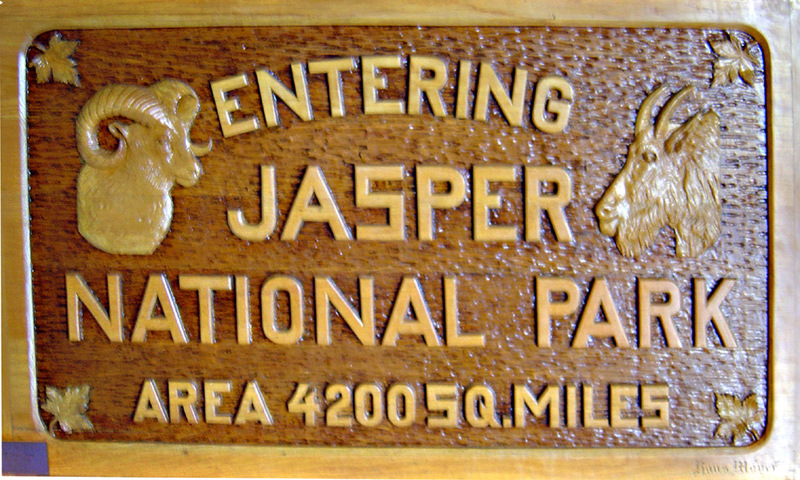 We took a jaunt across to Jasper last weekend. We haven’t been there at this time of year, and whilst the mountain valleys are free of snow, as you start to climb the mountains you suddenly hit the snow-line and the snow depth that still remains is huge. So much so, that it makes you wonder how long it will take to fully thaw. The views across the mountains and lakes are spectacular though. 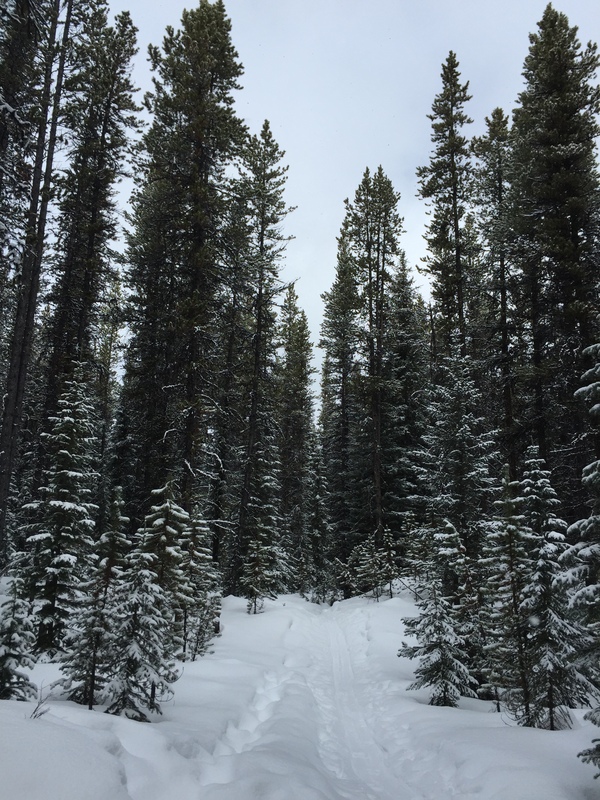 You alternate from being in early Spring down in the valley, to a ‘Narnia-like’ winter experience where the snow even on the conifer branches is 5 inches thick – it’s quite surreal. And quiet. I’ve never experienced ‘quietness’ quite like it when you’re in the mountains. Complete nothingness. Absolute silence. And still. The only sounds are from our feet tramping through the thick snow. I was almost expecting Mr Timnus (namely, James McAvoy from the Chronicles of Narnia films), to appear from behind a snow-covered tree. Failing that, I had hoped we may spot some wild animals in the forests and near the lakes, but these I suspect, were wisely remaining hidden due to our 3 kids who were grudgingly trudging along with us. I was sorely tempted at several points to feed one of them to any animals brave enough to put in an appearance but in the end we had to compromise on bringing them back home with us (the kids that is – not the wild animals), after we plunged the oldest kid into 3 feet of snow when she ‘helpfully’ doused her youngest sister with a vast amount of snow down the inside of her coat. We saw the funny side, but it took several hours before comedy and even the smallest hint of humour was felt by the kids themselves…..
We seem to spend forever planning and preparing for the imminent arrival of Christmas and all the festivities that go along with it, and yet no sooner has it arrived, then it’s over and we’re now already heading midway into January. It’s frightening how fast time goes. 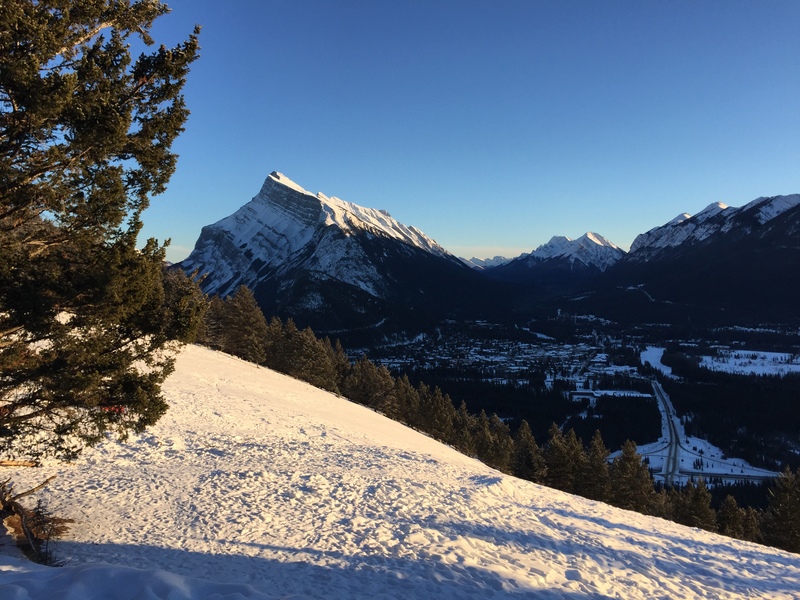 But in terms of Christmas, we’ve just had the fortune to celebrate our second Christmas over in Canada – and we made a concerted effort to try to make the most of the break by doing new things and trying different activities. My last blog mentioned the various shows and attractions we went to see with the kids just prior to Christmas (click here for a reminder). 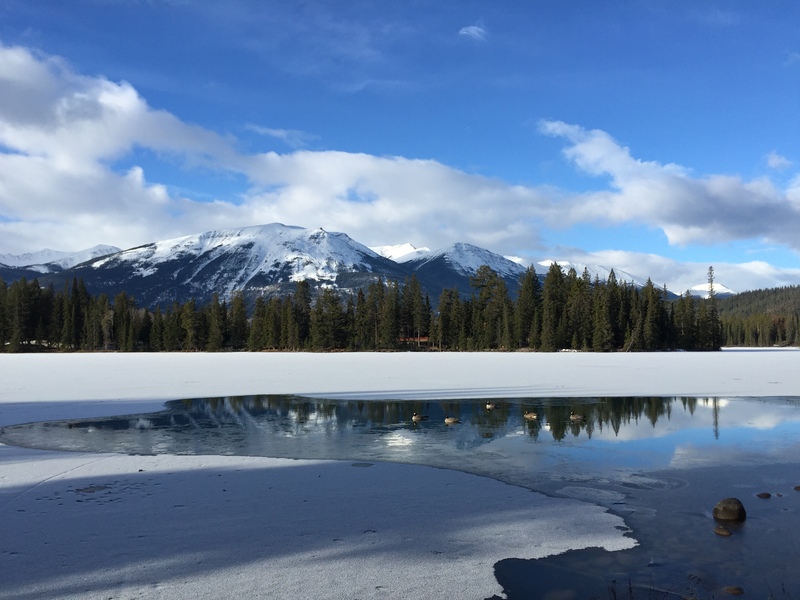 As soon as we’d recovered from the Christmas Day excesses, we hit the road, and travelled the 4hrs over to the Rocky Mountains and Banff. Edmonton isn’t renowned for its hills, so you can never take away the delight of seeing the Rockies slowly appearing on the horizon after 2 hours travelling, and the size and scale of the mountains covered in snow. Ironically, we left Edmonton in -20, and arrived in Banff at -5. The heady temperatures didn’t last for long and the cold flipped on its head and plummeted us back to the ever so familiar ‘minus double digits’ for the remainder of our stay. That’ll teach us for thinking it may be warmer further south! It’s always nice to have people visit, and extra special this year was my best friend from home who flew over from the UK along with all her family to spend New Year’s week together. We’re both of a similar mould, and making the most of a week together with family members whose ages ranged from 6 to 76 required a detailed plan and meticulous planning which we’d been developing for the last 2 months. One of the first activities all bar the seniors of our party were first to attempt, was skiing. We opted for a family lesson, and ended up with a tutor from Cardiff in good old Wales. I lived in Cardiff for a while years ago, and we happily compared notes and places as we traversed the mountains. It’s the first time I’ve been skiing in the mountains since doing it in Europe many moons ago, and you forget the staggering views and scenery at the top of the mountains, just after you disembark from the chair lifts. Trying to concentrate on the terrain is hard work when your eyes are constantly drawn to such wonderful views – and the skiing itself is crisp, dry, and beautiful powder snow to ski on. We had a brilliant day. Next on the itinerary was ‘dogsledding’. It’s been on our bucket list of things to do in Canada and it didn’t disappoint. 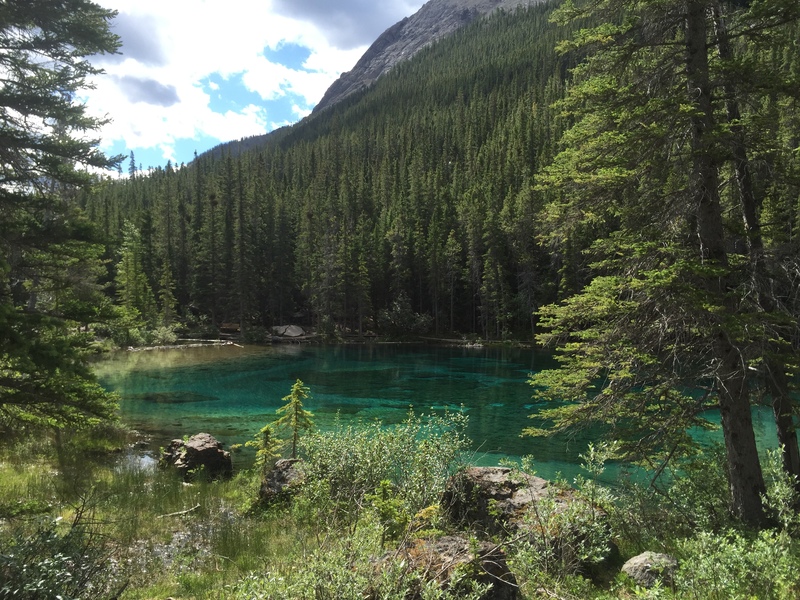 We opted for a firm just based outside Canmore – probably one of my most favourite places in the Rockies – who take you via minibus about 17km towards Spray Lake. There, you’re greeted by tour guides and 185 huskies who are all excited about being hooked up to sleds and going for a 10km run. 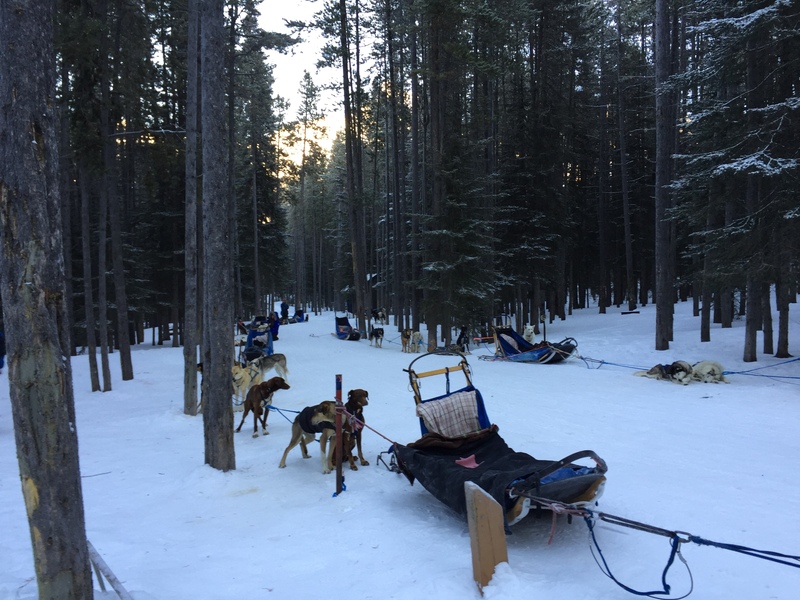 The dogs howl and jump with excitement until the sleds are off and then within an instant, there’s complete silence as you move along the trail except for the patter of paws on the snow and the occasional encouraging command shouted by the guide. The sleds are surprisingly comfortable and the winter views of the lake and forest scenery, spectacular. We even had the rare pleasure of spotting a moose with her youngster moving through the trees – brilliant! Nature at it’s very best – and certainly puts life into context when you can be out and about just witnessing such majesty. Amazing. Spending time together, doing stuff together, sharing experiences together is what makes such things memorable. And it truly was. It was a great week spent with friends and family – and all the more important to us as they’d flown from the UK to spend it with us. We certainly had a few comic moments too – and we’ll be dining off and recounting these for years to come! What a way to start 2016 …. My in-laws are in their mid-80’s and had never envisaged a trip to Canada, believing that physical limitations and sheer old-age, preventative factors. However, following a series of prompts by us and eventually, just buying tickets with the dates for their travel, meant there was nothing for it, but for them to board the plane – and they arrived without incident and importantly, all completely intact. That was nearly 3 weeks ago and during this time we’ve seen an abundance of superb weather and also some excellent trips out – both near and far. It’s made us explore and find things to do that all parties enjoy, and for the last 3 weeks it’s been particularly challenging as accessibility with wheelchairs has had to be incorporated into the mix. I’ve had to balance limited physical abilities alongside the abundance of energy my 3 kids display and need to burn off on a daily basis. So, we’ve had some delightful trips. 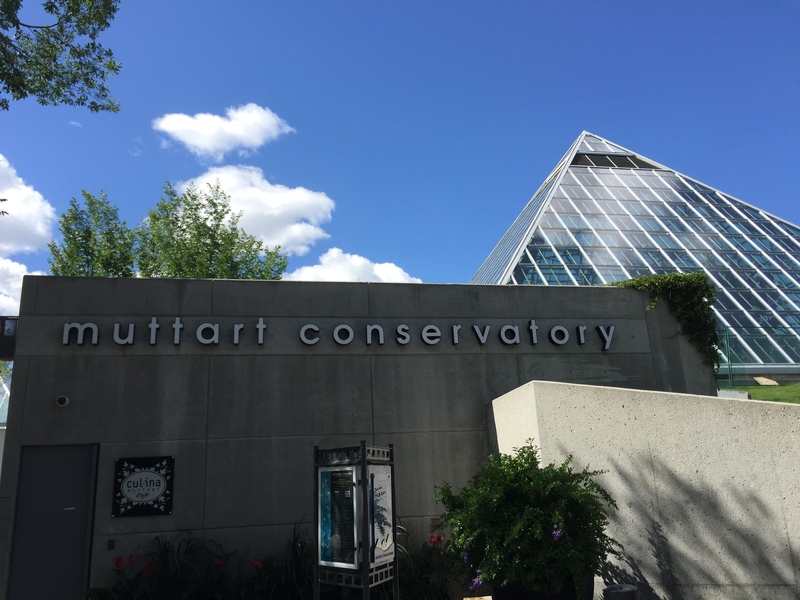 One was to the Muttart Conservatory in Edmonton. 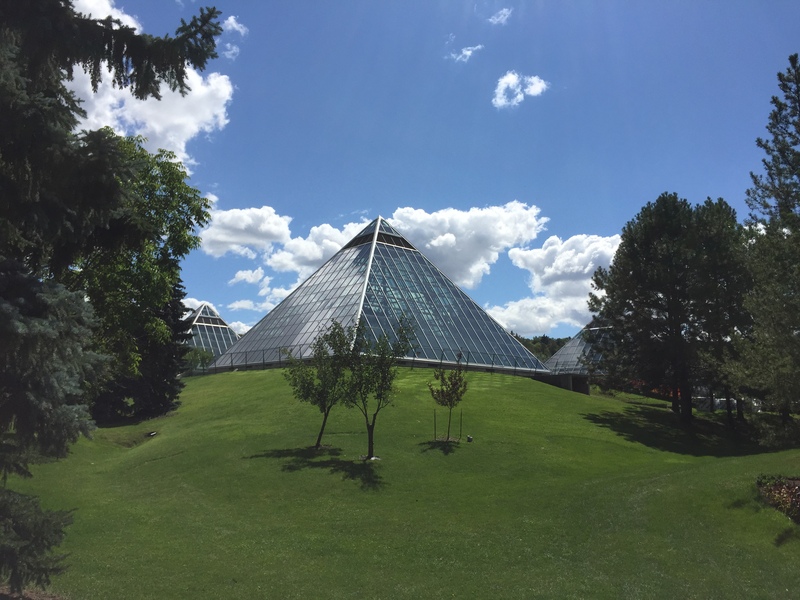 It’s set in the River Valley just outside downtown Edmonton, and has 4 glass pyramids. For those familiar with ‘Eden’ in the UK, it’s very similar but on a much smaller scale. That said, the Muttart Conservatory is an accredited museum and is home to one of Canada’s largest botanical collections. There are 3 biomes, each displaying a specific climate year-long. Temperate (very similar to the climate in Edmonton), Arid (desert and drought-like), and Tropical (humid and hot) each host an array of botanical delights that have their own appeal. The kids loved wandering around and looking at the different varieties. The fourth pyramid is entitled ‘Feature’ and provides a themed display which changes approximately 7 times a year. At the moment, it’s theme is ‘Journey to Middle Earth’, and along with a ‘hobbit’ home, wizard, dragon breathing out plumes of smoke through its nostrils, along with cascading waterfalls – it was truly amazing. There was a photo with both dragon and my mother-in-law that both myself and my father-in-law had a chuckle about as we both had the same caption in mind. 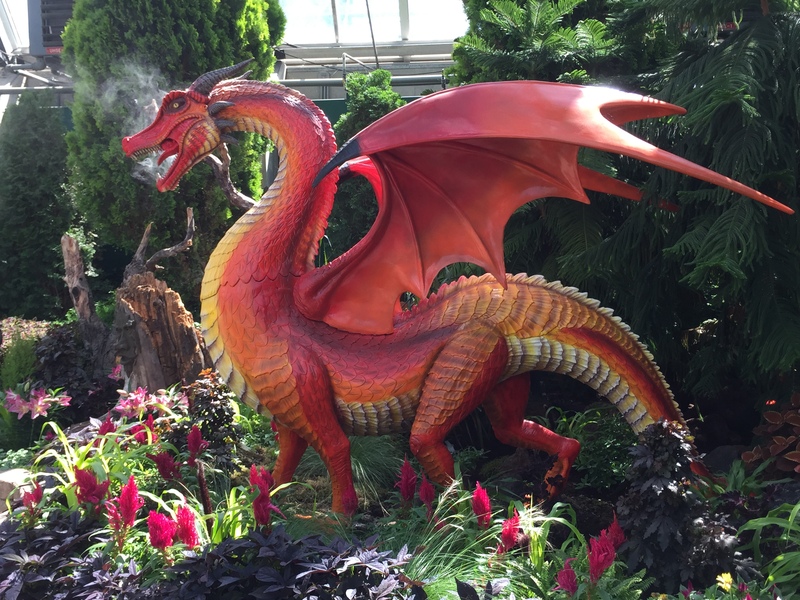 Suffice to say, I’ve not included it here, I’ll leave it to your imagination – you’ve only got the painted dragon to feast your eyes on below. The latter pyramid was definitely the most striking of the four, but with wheelchair access available throughout the displays, it meant all members of our party could see everything and experience it together. Brilliant. 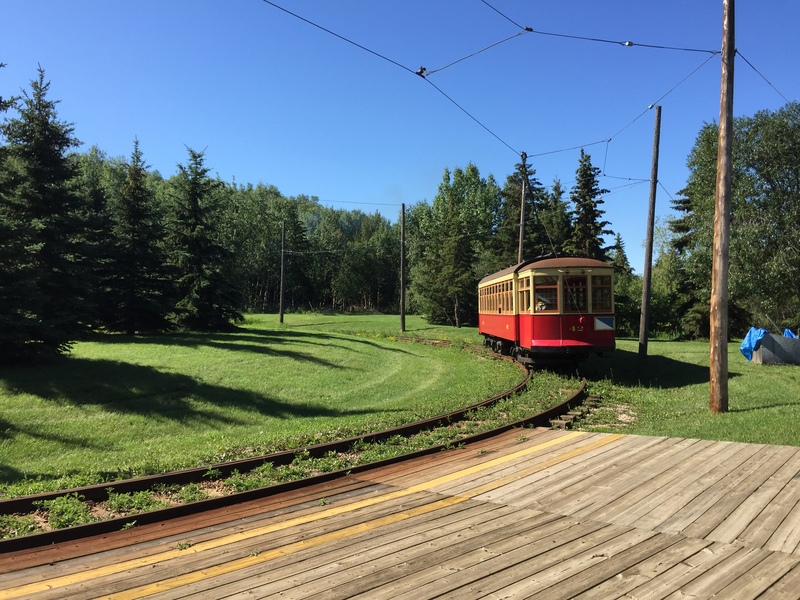 Fort Edmonton was another day-trip affair. 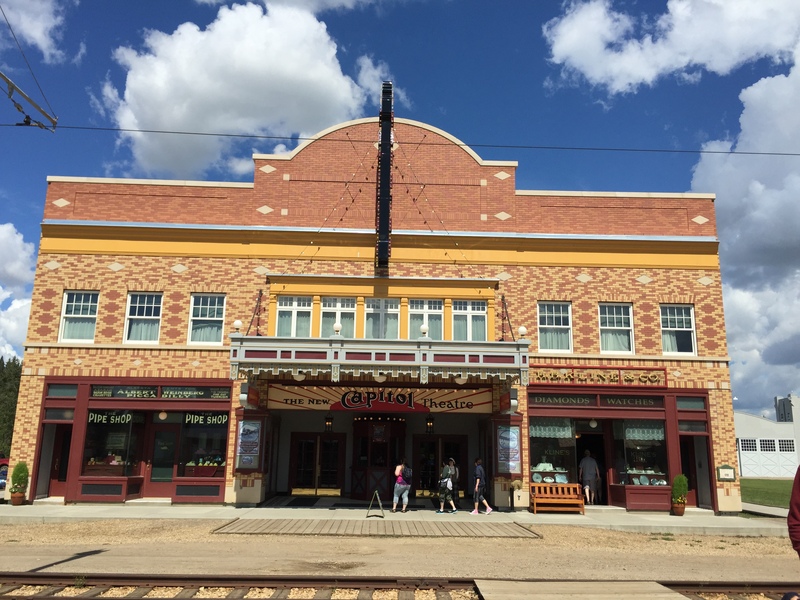 Edmonton’s heritage park takes you back to 4 eras. 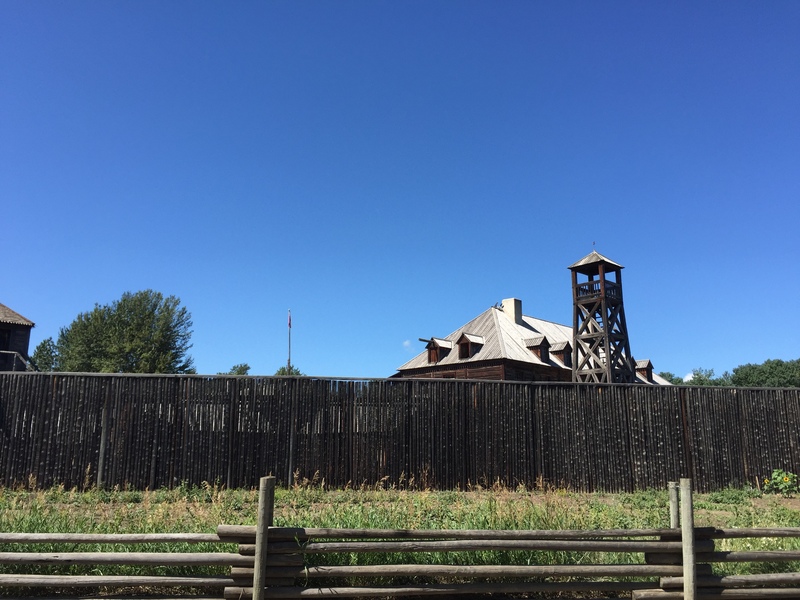 The original Fort built in Edmonton from 1846 signifying the fur-trade era is an impressive structure, and shows how tough it must have been to live and survive in such a harsh climate without the joys of central heating or warm clothing. 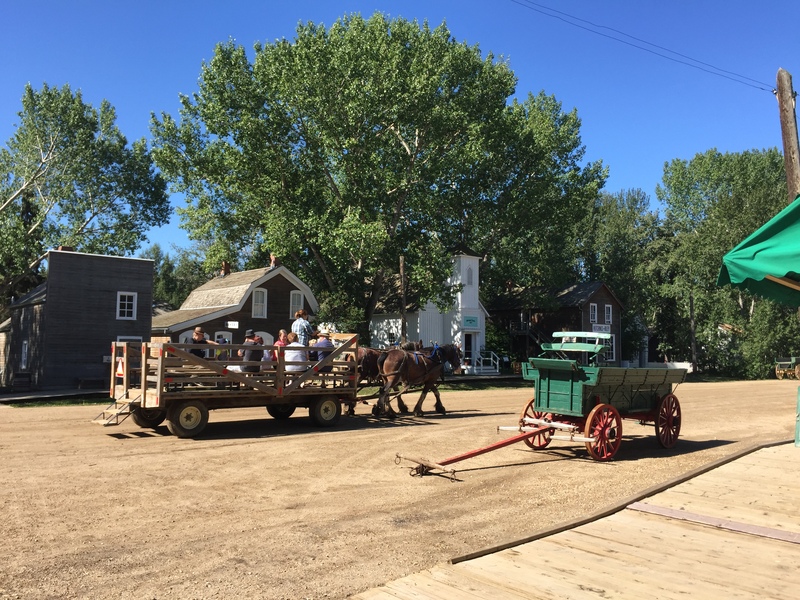 A street depicting 1885, and the hardships the first settlers had to go through is full of original buildings from this time which have been re-sited and located in the park alongside each other. 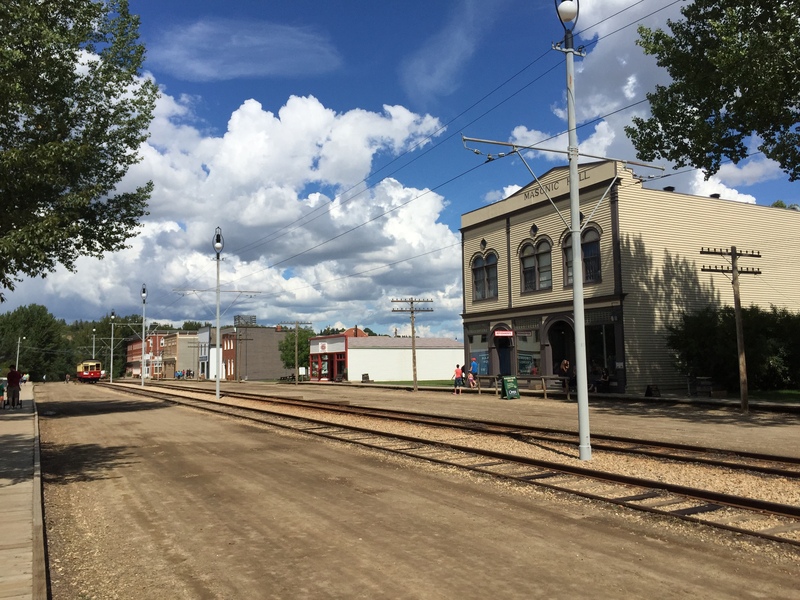 This is followed by a street from 1905 and Edmonton’s growing municipality, and then finally 1920 with ice-cream parlours, motor vehicles and movie-theatres. It’s brilliantly done, staff are dressed in clothing from their specific eras and take the form of residents in each of the communities. 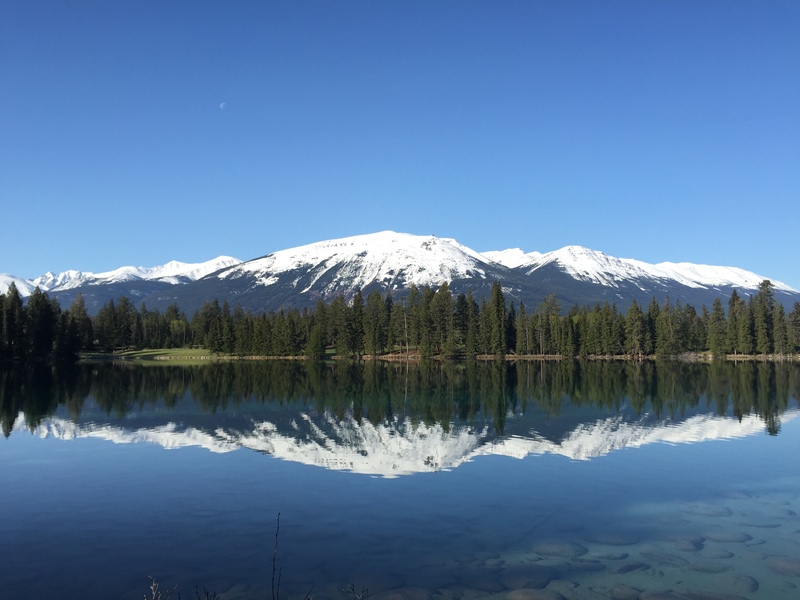 Further afield, and a trip to Western Canada isn’t complete without a visit to the mountains and the awe-inspiring Rockies. Jasper was as beautiful as ever – we’ve been there 3 times now in the last 12 months, and has become our favourite destination of choice. Lovely to see the mountains without snow for a change, whilst the most impressive view was when my oldest kid and I took a walk around Lac Beauvert at 6am in the morning. The sun casting red glows on the peaks of the mountains above and only the sound of the animals for company – staggeringly beautific and iconic. This was followed by a brief jaunt to Lake Louise, a mega tourist attraction, but when you arrive at the lake you completely understand exactly why. Nestled in between the mountains, the lake is the most gorgeous turquoise colour you can imagine, and it’s a view you can never tire off. 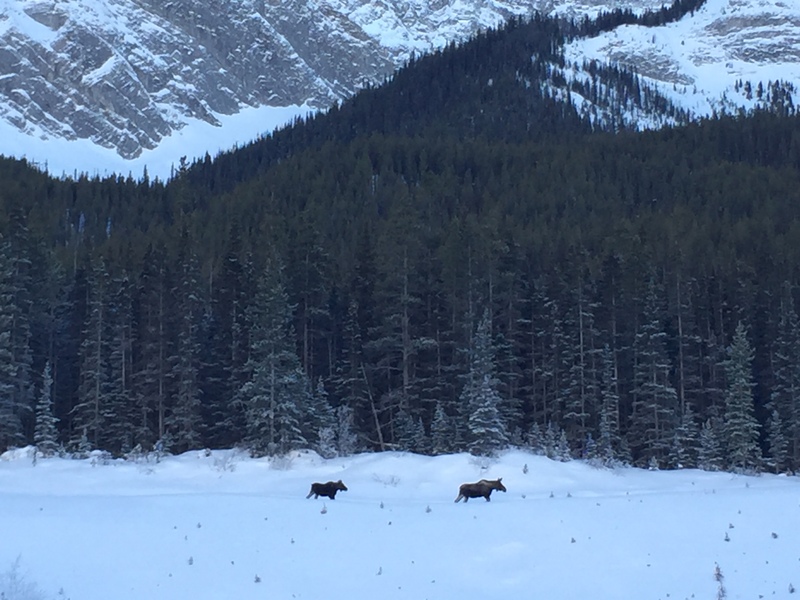 The older generation were staggered by the breathtaking scenery and along with a car journey that takes you through the Icefields Parkway – one of the most scenic drives in Canada – were stuck for words. It even took their minds away from the lure of ice creams for a brief period! 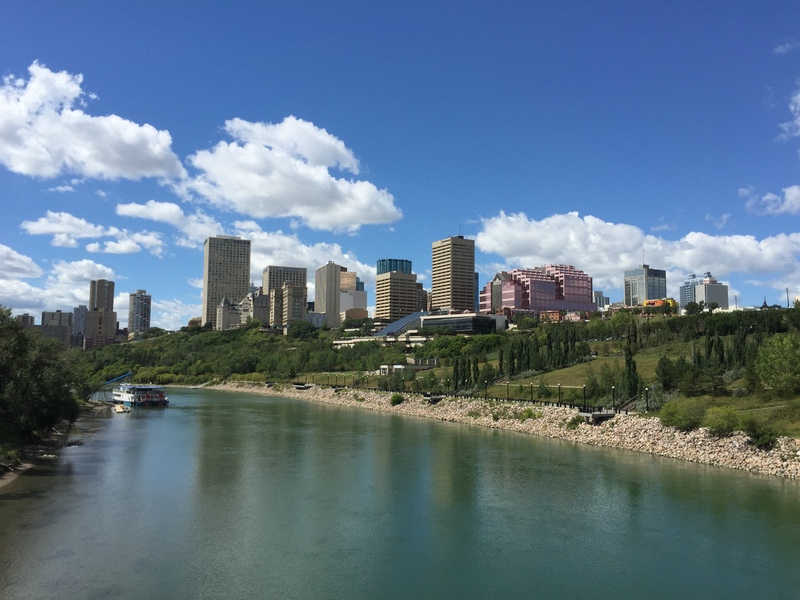 Back in Edmonton, we’re now taking things easy for the last few days of the grandparents stay with us and I’m sure it’s a trip they’ll never forget – for numerous reasons. More importantly, it’s given everyone a replenished sense of connection with one another, shared experiences, and unforgettable memories. It just goes to show, that no matter how old you are, you can experience things you never thought possible – and truly benefit from the process. 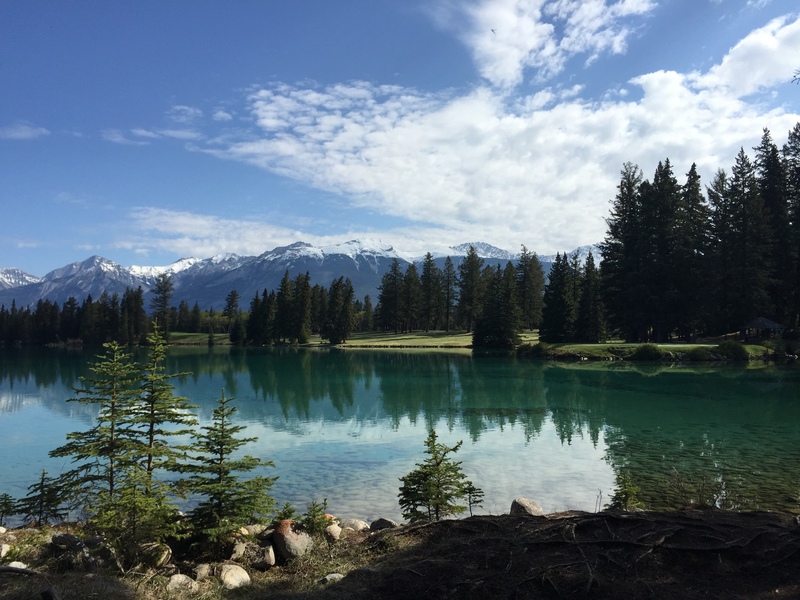 A trip to the Canadian Rockies is always a superb experience and a wonderfully scenic visit, but one of our favourite places to stop off at, is Canmore – just south of Banff. 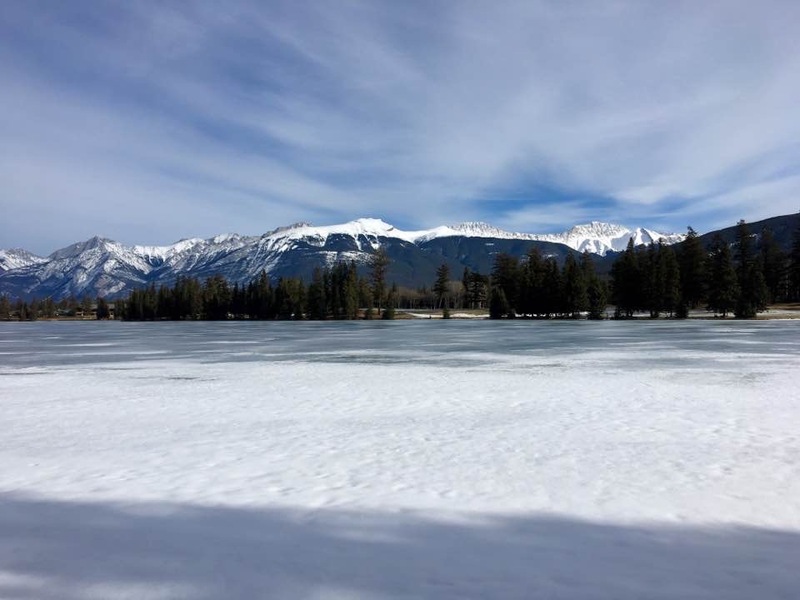 It’s an old mining town, nestled in between the mountains so you get 360 vistas all around – but without the touristy lure and trappings of Banff or Lake Louise. As a result, it’s much more authentic. The main street with shops are individualistic and it is riddled in character and a great atmosphere. 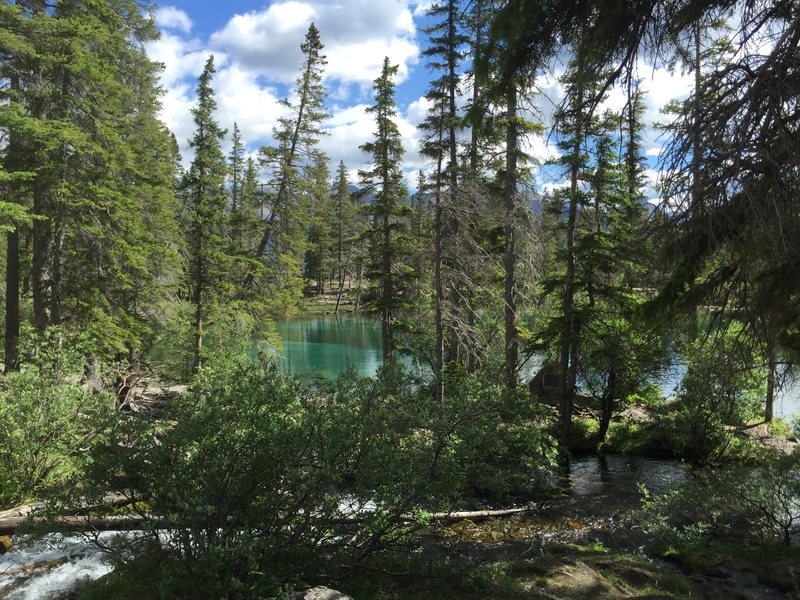 There are some lovely walks along the banks of the Bow River, but for our visit this weekend, we took a walk up to Grassi Lakes. 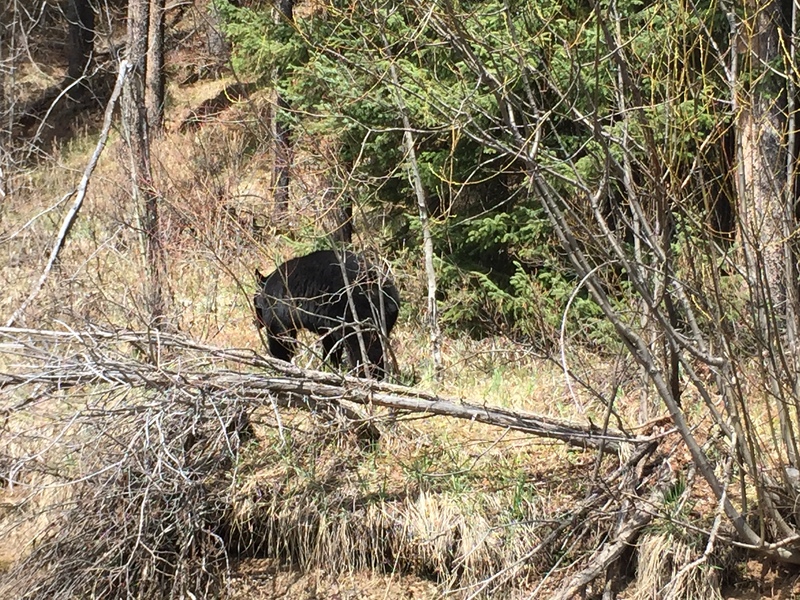 Bears are still very active and the advice from the Information Centre is to ensure you have some ‘bear spray’, as the berries are starting to come out and are a major attraction for our furry friends. Following a 90 second demonstration on what to do should we fall upon a grizzly and how to operate the canister ‘in-haste’ – plus signing a declaration that we wouldn’t use it for any other purpose – we were good to go. The resulting conversation from the 3 kids for the first 30 minutes into our walk, was a preoccupation into the detailed arrangements should we encounter a furry beast – not helped by suggestions of feeding the youngest as a sacrifice to it first, whilst the rest of us made off as fast as we could. The youngest was understandably perturbed by this proposal and it was concluded that it isn’t the ability to outrun the grizzly we need to be concerned about – just to be able to outrun the slowest member of our party … let me introduce you to the grandparents who are currently visiting ….!! The youngest was decidedly comforted upon this news that she wouldn’t be bringing up the rear. Anyhow, this certainly took care of topics of debate during the amble, and created a distraction for the kids whilst they traipsed up the paths to an elevation of 1500 metres. There are 2 small lakes when you arrive – both a vibrant green and turquoise which makes the journey thoroughly worthwhile. You also get the view of the Bow River down in the valley overlooking the town of Canmore too. There’s a large waterfall to see and an opportunity to take lots of pics. It’s not a hard walk and reaps rewards for the small amount of effort required – it’s also extremely popular so get there early to benefit the most. It was with slight disappointment we arrived back at the cars without an encounter or even glimpse of a grizzly – although if the bears had any sense, they’d wait till it was quieter in the evening to eat the produce in relative peace. Given my 3 kids, I wouldn’t have blamed them at all. 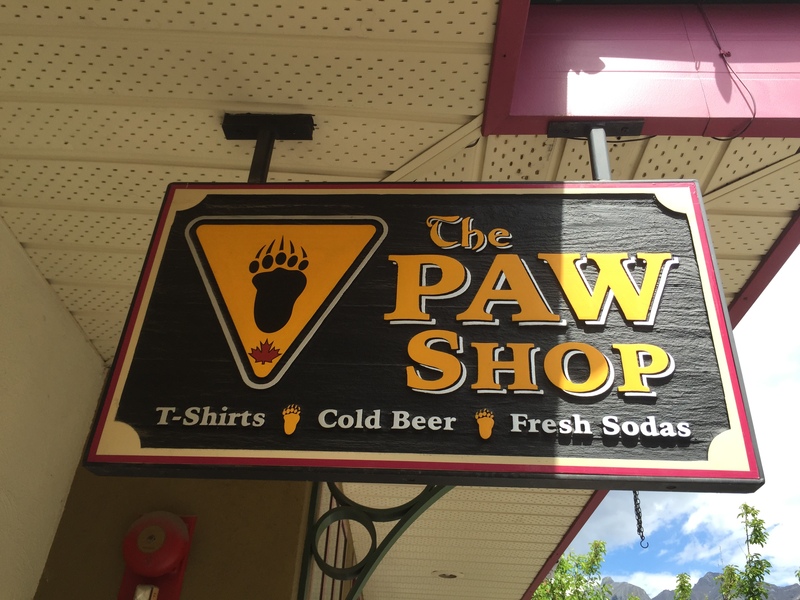 For the humans, there are some culinary delights worth testing out whilst in Canmore. 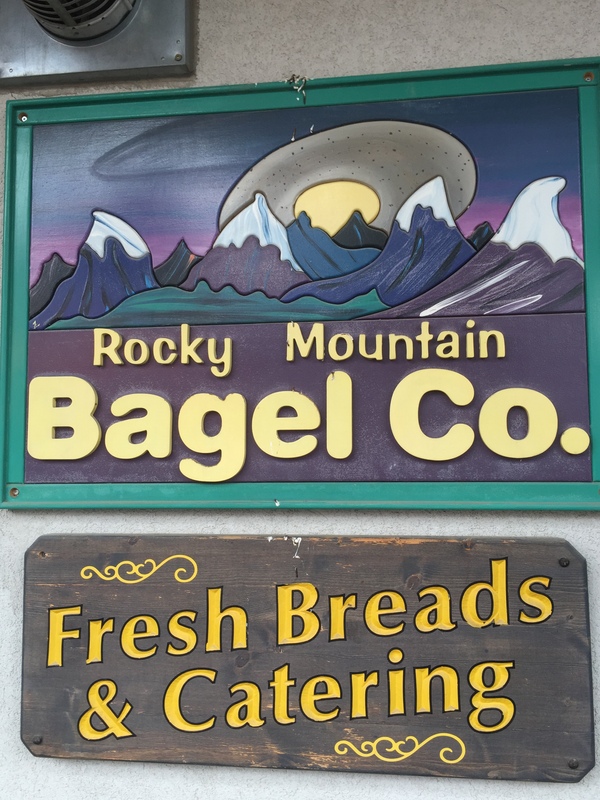 The Rocky Mountain Bagel Company, on the Main Street makes 12 different varieties of bagel each night and the sandwiches they produce are mouth-wateringly tasty. We tried the ‘Mountaineer’ – pastrami, cheese, salad, mustard and gherkins – which we had on a jalapeno-cheddar bagel. Truly delicious. There’s also one of the oldest buildings in Canmore to visit, built in 1893. Not old by European or UK standards, but significantly old in this area, and the original home of the Royal Mounted Canadian Police who were stationed in Canmore earlier last Century. Prior to this, were there any disturbances of any description, troops from Banff were called in and suffice to say, by the time they often arrived, the event had either culminated in disaster or has dissipated completely. Those were the days. 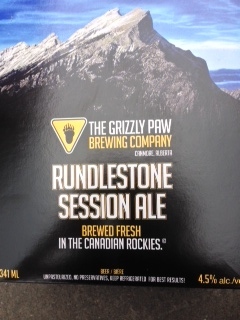 So, a good weekend was had by all and should you ever find yourself in this neck of the woods, give Canmore a visit and let me know what you think. I suspect you won’t be disappointed. In the meantime, we’re into our final week of the school term and the prospect of hunting for dinosaurs looms ever closer (and this isn’t a sarcastic reference to my parents – honest!). More to follow …. Well, as weekends go, it’s up there as one of the most memorable and absolute best. 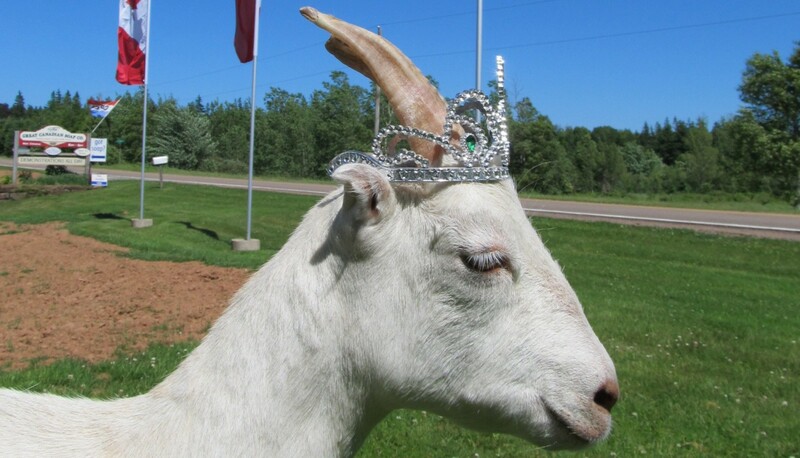 It was Mother’s Day in Canada last weekend and feeling rather like the Queen, I decided to celebrate it twice (the UK had the pleasure of this event back in March). We also took the rare opportunity to venture away for Mother’s Day weekend – where usually we have either or both of the grandparents round for a meal and celebrations. Obviously, a little more difficult given the distances between us, so this year we ventured further afield and thought about ticking off some more items from our bucket list. In fairness, it’s not the most scenic either till you come through a small town called Hinton, about 3 hours into the trip. Just after the town, you get the first view of the mountains and they are remarkable. Being Spring, they are still snow-laden at the top whilst all the trees and valley floors have melted and are turning a vibrant green. The weather had clear blue skies and sun shining. Beautiful. I was slightly concerned about the timing of the weekend away as last Wednesday saw continuous snow in Edmonton to a depth of 20cm. It was a bit of a surprise to be awoken to, but hey, guess that’s part of the joys of living in a Winter City! All gone – thank goodness – by the Friday, and even then, nothing stops here for the sake of a bit of snow. We’d never get anything done otherwise. Anyhow – back to the trip. A brilliant place to stop off at is Miette Hot Springs – about 40 mins before you get to Jasper. 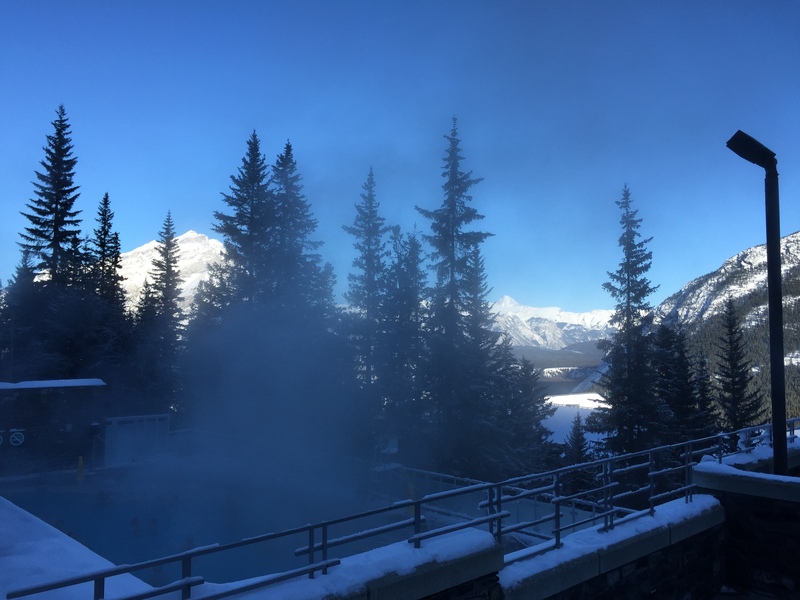 Miette Hot Springs, located in Alberta’s Jasper National Park, features the hottest mineral springs in the Canadian Rockies. Water flows from the mountain at 54°C (129°F) and is cooled (cooled!!! I tell you), to a comfortable 40°C (104°F). There are 4 pools – each of varying temperatures from hot, to very nice, slightly cool, and then absolutely freezing – containing the minerals sulphate, calcium, bicarbonate, magnesium, and sodium. It’s hilarious watching the kids jump into the coldest pool (none of the adults seem to be willing to attempt it), and seeing their faces and the speed with which they made a fast exit. It’s also all outside, so you get to wallow in the waters whilst admiring the views across the mountains. Bliss ……. 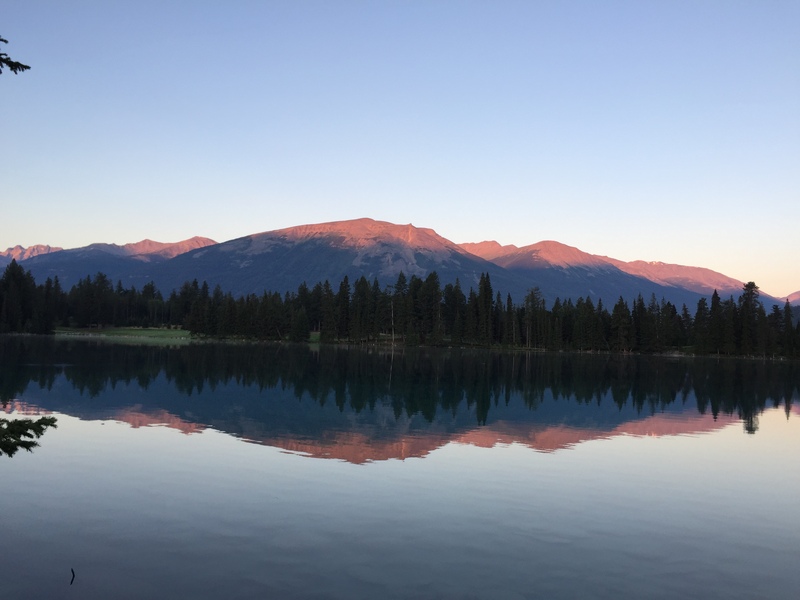 Jasper itself is a lovely town – and less riddled with tourists than the popular Banff and Lake Louise destinations which are another 3 hours due South away in the car. You get to spot lots of wildlife – who were out in force last weekend – as you travel along the National Park roads. 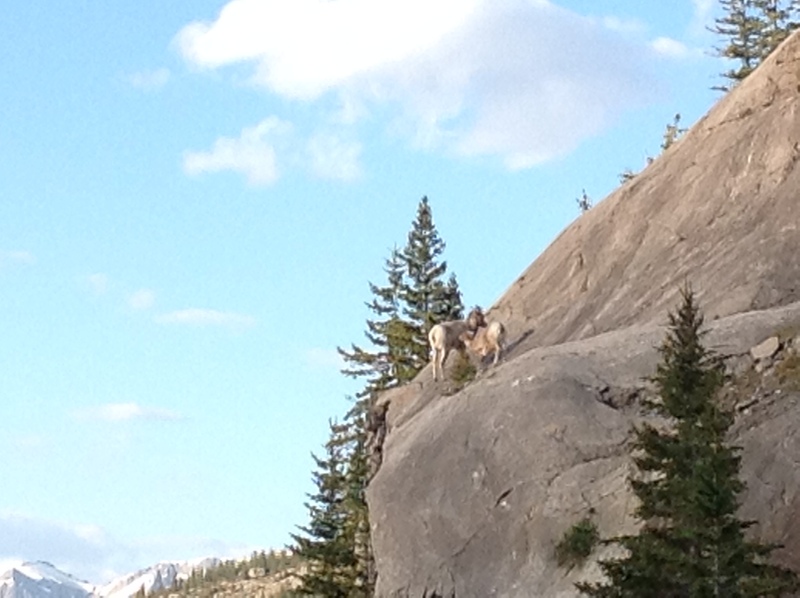 Elk were in abundance, as were Mountain Big-Horn Sheep, and Black Bears! 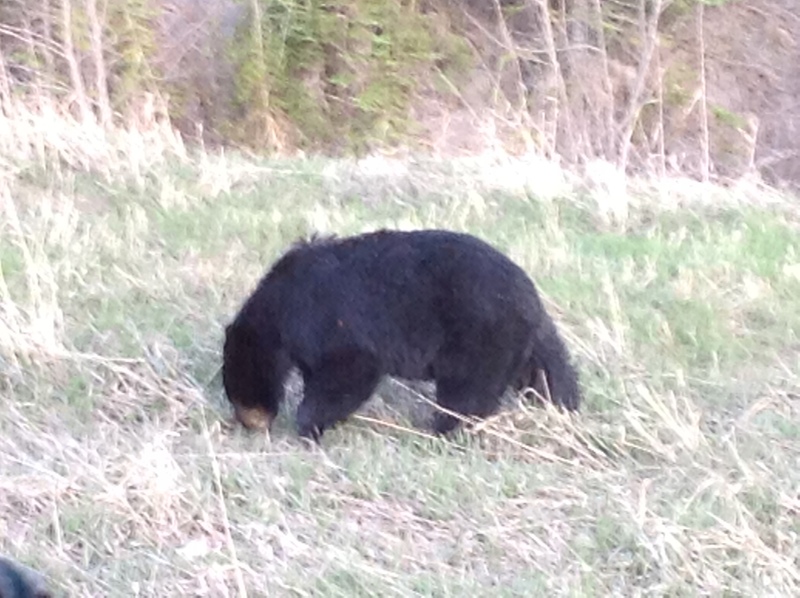 Just watch for the tail-lights of cars stopping up ahead and pull over – there’s usually something to see – and we managed a tally of 2 Black Bears during the weekend. Just don’t venture out of the car … fleeting observations of a wolf on 2 occasions, plus the obligatory Canadian geese, squirrels and birds. Only the Moose was more elusive and has yet to be spotted. Then there’s the scenery. It’s awe inspiring, majestic and breath taking. The lakes nestled into the valleys which are turquoise and crystal clear, reflect the snow-topped mountains and the silence is deafening. It’s one of the best places in the world to spend time. Instantly from reaching the edge of the National Park, you start to relax and savour the views. I tell you, I couldn’t help but reflect that being able to experience and see these wonders just within a weekend trip away – it’s not something most people have the chance to do, even for a holiday. Amazing. Warrington, England certainly can’t compete with this and even the Lake District (one of my favourite places to visit in the UK), is not remotely on the same scale. 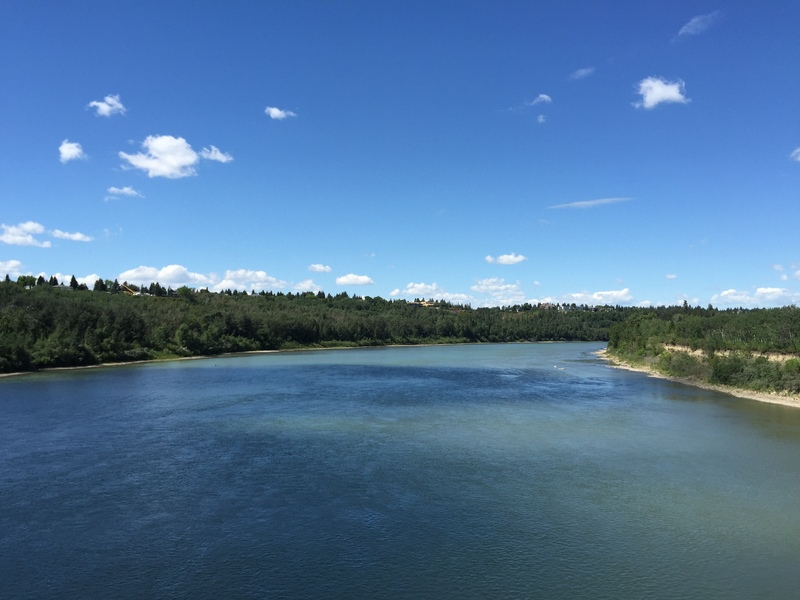 I’ve mentioned in past blogs about the delights of travelling in Canada, the ability to enjoy the country and savour the surroundings without significant numbers of tourists and volumes of traffic. 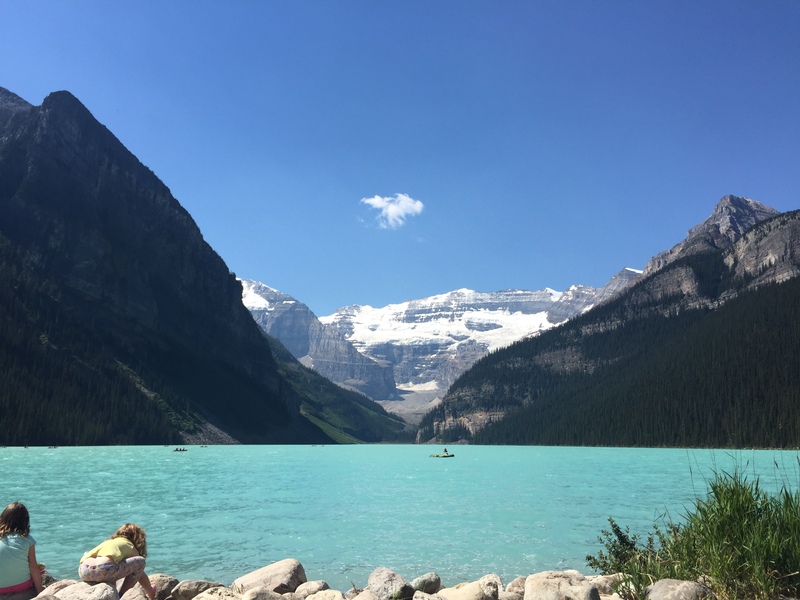 There’s an imaginary line which starts at Lake Louise and follows the Trans-Canadian highway down to Banff – both beautiful places and the highway connecting the two has wonderful vistas, but it’s also the honeypot every tourist is seeking to taste. 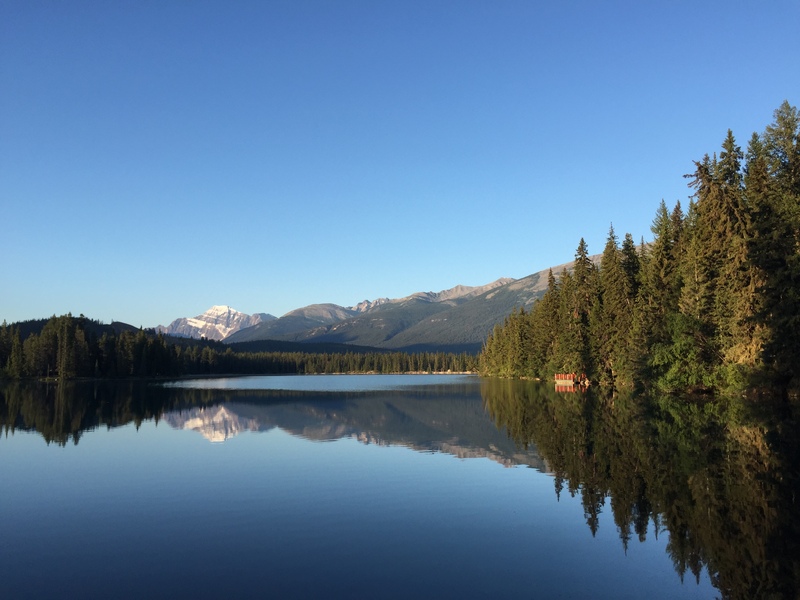 The drive south of Lake Louise down to Banff is relatively short (by Canadian standards) – and not deprived of scenic vistas and mountain views. 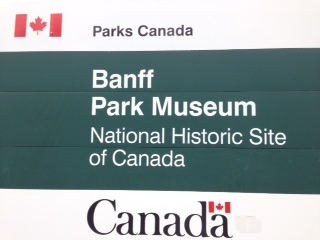 In fact, I thought the Banff National Park particularly stunning but for those wishing to savour the experience and the views with an element of authenticity, an out of season visit would be more fruitful. 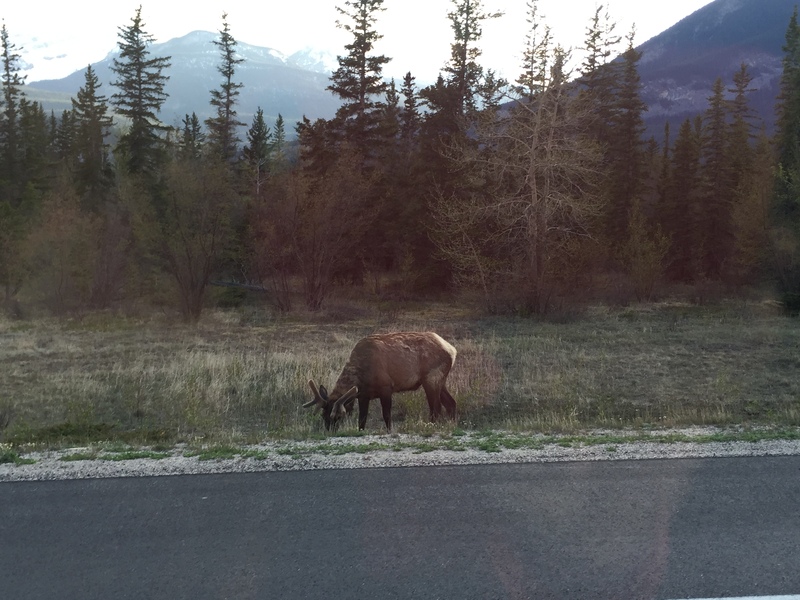 Upon arrival in Banff, and as in Lake Louise, you’re surrounded by tourist coaches, cars and people whisking tourists and their cameras to their next destination stop. It has character, but this is masked somewhat by the volumes of people equally wanting to sample some of the atmosphere and views. We stopped and walked along the main street. 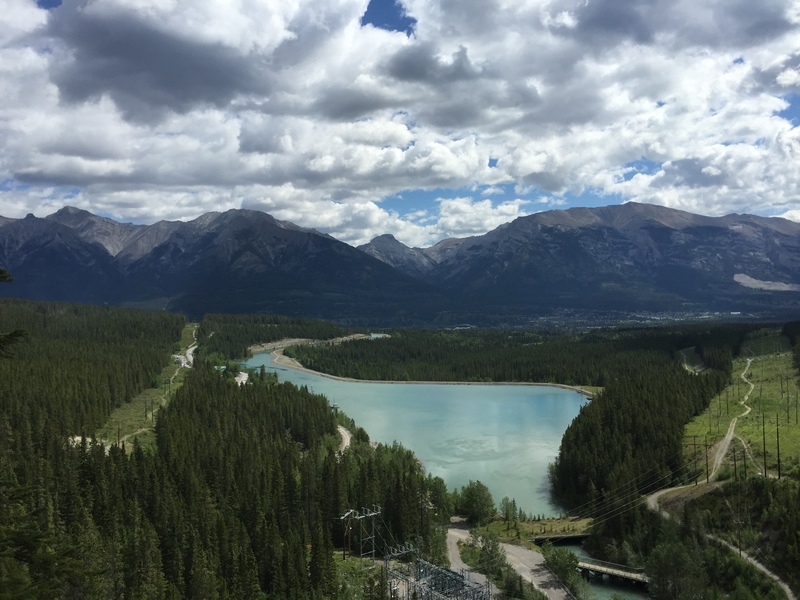 They have a great playground for kids which is just outside the Banff Information Office and museum – a large granite stone which encourages children to climb and play on – the kids loved it. I just felt it too touristy (sorry Banff), and was keen to continue our journey to Canmore which is only a further 20 minutes drive south. 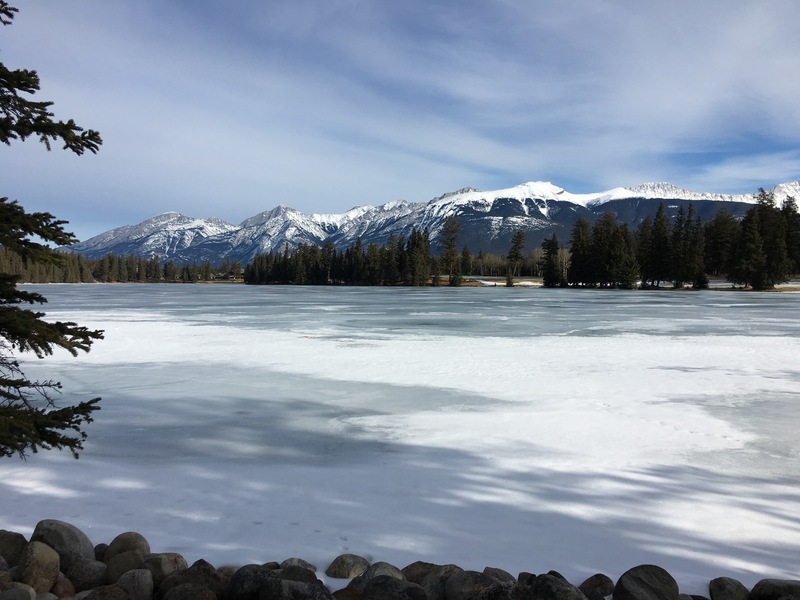 Canmore has the feel of a working Canadian town – almost the place where those working in Banff actually live and relax. 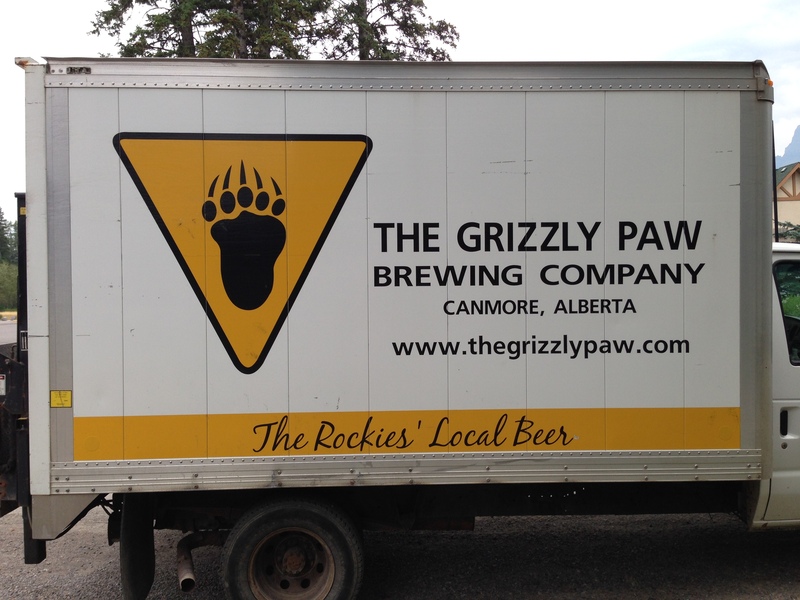 There’s an excellent brewery – the Grizzly Paw Company – which brews it’s own beers and sodas in a beautiful wooden brewery just outside the main town centre. Definitely worth a visit – they offer ’tastings’ of both beers and sodas, but after my youngest ‘kid’ asked for her fourth ’sample’ of the grapefruit soda, we felt we were outstaying our welcome. (As an aside, they do tours around the brewery on a Friday, Saturday and Sunday – had we managed to coordinate our schedule, we’d have loved to participate in this). We had to be content with tasting some of the beer, buying a dozen bottles of both beers and sodas, and chalking this up as a ‘must visit again’ when we move over to Canada properly. 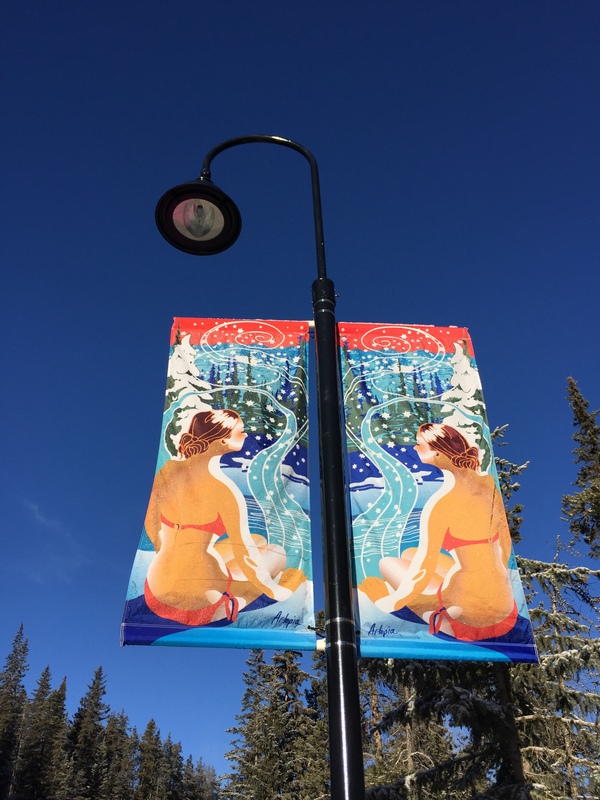 The town of Canmore has real character and a buzz about it. 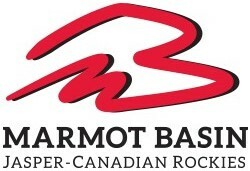 Each store is individual, distinctive and seems to epitomise Canadian living. We stumbled across ’The Banff Bagel Company’ – a cafe which makes it’s own bagels and offers coffees in a variety of strengths and flavours. It’s homely and warm, and we ordered several bagel sandwiches which were ‘to die for’. The pace is relaxed and unhurried, you really do feel as though you could stay in there all day. As for the bagels themselves, if I ever want a bagel sandwich in the future, each and every one will be measured by the superb taste and texture of the one I devoured here. 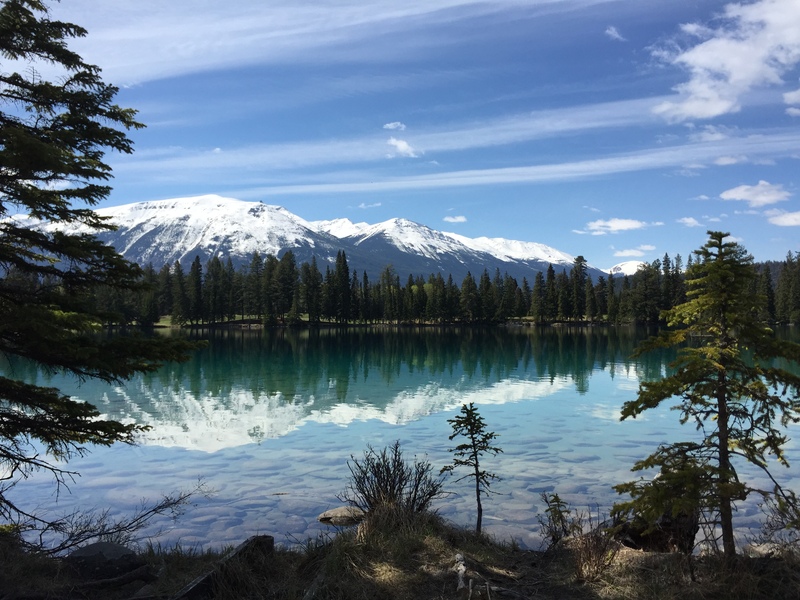 We loved Canmore and felt it was a truer reflection of a town in the National Park, and one without significant numbers of tourists – although the irony that we are tourists too, isn’t lost on me!!! Sad to leave, we progressed along the Trans-Canadian Highway to Calgary. All in all, from Lake Louise to Calgary it takes approx 2 hours. You exit the National Park and slowly the mountains get more distant, the land gradually flattens out as Calgary looms closer.